The most recent additions to the Community Collection represent two very different observations of the city as historical document. One is European; the other Oriental. Yet both are in a style popularly called Mid-century Modern. Compare Kumagai’s “Abstract City” with Mario Micussi’s glimpse of the Roman Forum. But Kumagai’s woodcut is also interesting in light of the influence that the Japanese aesthetic has had on the West—and the reciprocal influence shown here. 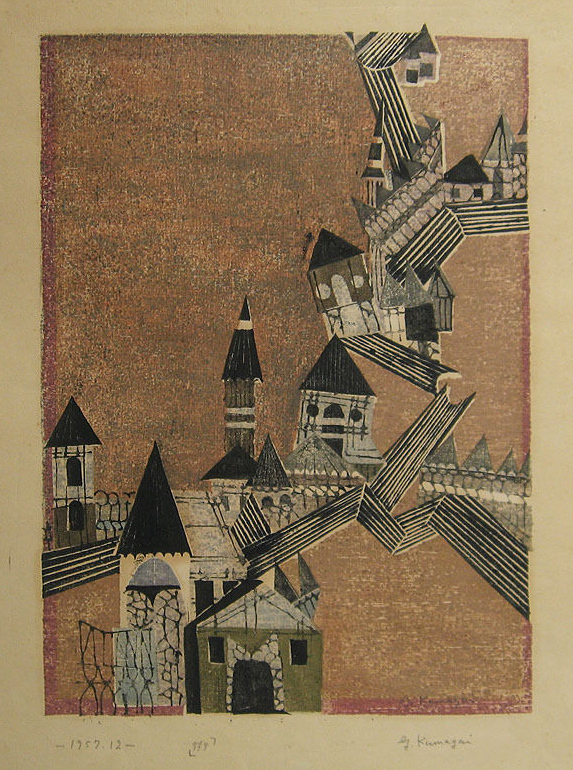 This print was acquired from the estate of Maureen and Bill Bendix, developers of Riverside Addition in the 1950s. Their home on Sixth Street NW was among Agincourt’s earliest examples of Mid-Mod as an architectural phenomenon and its interior must have been an equally potent representation of that aesthetic. By agincourtiowa in Landscapes & Livestock, Uncategorized on Wednesday/14/February/2018 .